I’m pretty much a sucker for anything by Bruce Sterling so I was giddy with glee to see a Bruce Sterling ARC available. This really isn’t a novel and I’m not even sure it’s long enough to be considered a novella. Novelette? Short story? In any case, this is a short work of a really … well … interesting nature. In the 1920’s a ragtag band of free-thinking warriors took over the eleven square mile ‘Free State of Fiume’ between Italy and Yugoslavia. They took to calling themselves ‘pirates’ and the book centers on Lorenzo Secondari, Pirate Engineer, who observes his comrades changing from warriors and rebels to politicians and business leaders trying to create that perfect country. Sterling tells the story in true pulp fiction manner and brings in characters such as Robert E. Howard and Howard Lovecraft and Harry Houdini. The book feels like a story and not a book, even when reading it. We get flashes of something, but no flesh. The characters are not developed and instead we move along at pulp-pounding-pace. The last third of the book (or so) is an interview with Sterling who gives a brief account of the real history of Fiume. I enjoyed this and it had me doing a quick Google search of my own to learn a little more. Perhaps the best part of the book is the beautiful art by John Coulthart, who captures the Art Deco/war years style to lead off the chapters and divisions of the book. The art alone is worth checking out this book. The idea is wonderful and I liked this twist on the alternative history fiction (a genre I don’t usually care for), but this is probably my least favorite Sterling book to date. Looking for a good book? 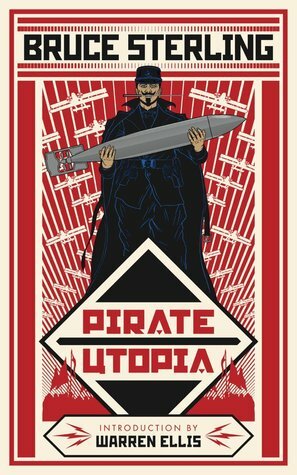 Pirate Utopia by Bruce Sterling is a short book about some idealizing ‘pirates’ in the 1920’s who take over and develop their own country. Buy it for the art and enjoy the story. I received a digital copy of this book from the publisher, through Edelweiss, in exchange for an honest review.